Nat Turner is a violent story and therefore a violent book. The story is told through images with occasional excerpts of text from Turner’s confessions. While the images in the original four issues were black and white, the Abrams edition is done in sepia tones. Due to its violent and graphic nature, this is a book for mature young adults/teens and older. It’s a Holocaust Book. It begins with Turner’s mother being kidnapped from Africa, being shaved and branded, stuffed in a feces and rat filled ship’s hold, being chained and sold into slavery. Young Nat’s father runs away…which is devastating to him. As an adult, Nat’s beloved wife and children are sold and taken from him screaming. Finally, he has an inspiration. Nat organizes an armed slave revolt and a lot of people get killed in big action scenes…. 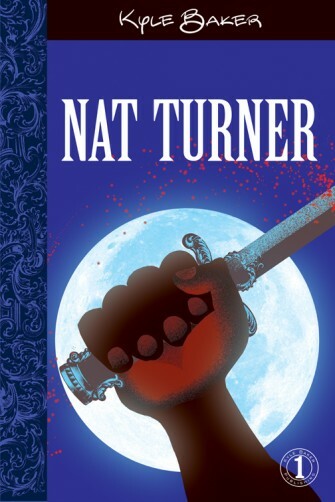 Nat Turner is the story of slavery and the horrors that led Turner to lead one of the bloodiest revolts of the time. It is told vividly through wordless images and occasional confession excerpts. 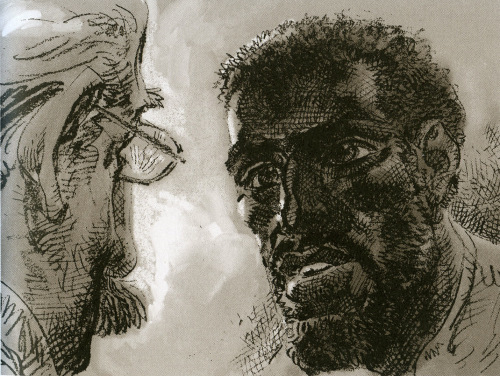 We learn and experience slavery and Turner’s life story as he retells it in his confession to Thomas R. Gray. We learn about how Africans were hunted, shackled, branded, and transported in rat-infested ships; how they were humiliated, inspected, and sold; how they lived or existed; and the hopelessness and cruelty they experienced. 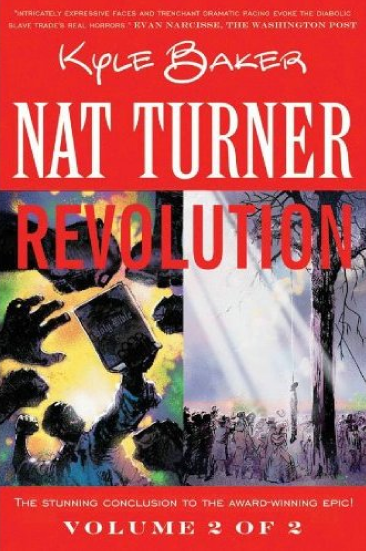 We also learn about Nat Turner: how he was told he was different, bright and inquisitive, and how he heard others saying he would not make a good slave and was destined for greatness. We learn the circumstances of his life, ending with his execution for leading a bloody slave revolt. While some felt Turner was a hero, others felt he was a monster. Kyle Baker leaves it for us to decide. The book is organized in four parts, along with a forward and afterward that I strongly recommend you read. There are also some author’s notes found at the end of the book, that provide enriching detail to the art and story. It is a horrible, upsetting story, but one that must be told. Baker tells it well. Note: Please use discretion with children, making sure they’re mature enough to understand and handle the details. Part 1: “Home” opens with a market scene somewhere in Africa. We see villagers whose facial expressions turn from interested and involved to panic-stricken as slave hunters gallop through their square. While trying to outrun and outwit the hunters, many are captured. They’re shackled, stripped, branded, and stuffed like livestock into a rat-infested ship that is trailed by sharks, waiting for dead carcasses to be thrown to them. We soon realize we are following Turner’s mother. Part 2: “Education” opens with a slave realizing something is amiss (Might it be an escape?) and communicates what is happening to others through the beats of a hidden drum. 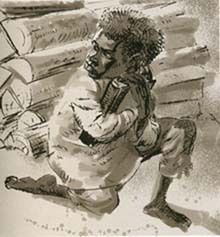 As Baker tells us in his notes, “Many laws such as the Mississippi Black Codes outlawed drums, which Africans used for communication.” We see the outrageous consequences faced by those who broke the laws and learn that both communication between slaves and education of young slaves was forbidden. 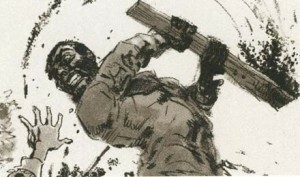 After this scene, we meet a young Nat Turner and learn about him through images and excerpts from his confession. We learn his father escaped and his escape deeply affected Turner; we learn that Turner was a quick and inquisitive learner, and once he learned to read (on his own), he read Bible and scriptures whenever he could. These readings greatly influenced Turner, who believed he was divinely inspired to lead some great role. Finally, we learn that Nat was a natural leader among his fellow slaves and began to “prepare for my purpose.” While Nat escapes toward the end of Part 2, he returns after having had a vision of his greater purpose. Part 3: “Freedom” is devoted to the rebellion itself. We see and read of the horrors and death inflicted upon Whites and Blacks. We learn that the rebellion was a bloodbath and slaughter as Turner led slaves through slave owners’ homes in Southampton County, Virginia, killing the owners and their families; murdering 55 people in total. This section ends as we see that Nat Turner survived the rebellion and hid for six weeks until was eventually found. Part 4: “Triumph” contains excerpts from the record of Thomas R Gray, who took Turner’s confession, and graphically shows the hanging of Turner as well as the crowd’s horrific reactions. 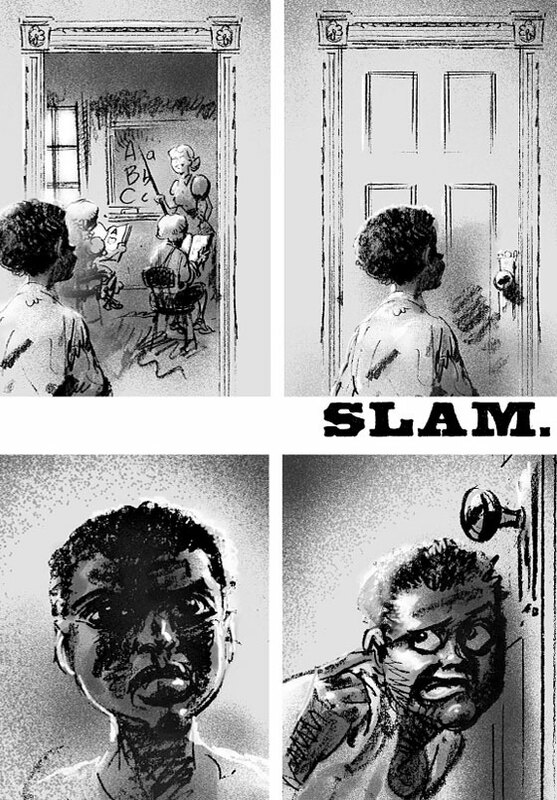 Kyle Baker’s graphic images relate these horrible, volatile events as we intimately view their unfolding, along with selections of Nat Turner’s confession. This work stands out for its effective and powerful use of visual storytelling. In the Abram’s version, Baker’s original black and white images are now sepia toned. Both versions contain sharp angles and shaded textures to introduce us to the human aspects and to the horrors of slavery. While the reader must construct the story through Baker’s images, Baker leaves it to each of us to decide whether Turner was heroic or immoral, or a bit of both. It is a powerful and potentially upsetting book and suggested for mature readers. In short, Nat Turner is a haunting, violent story of Turner’s insurrection on August 21-22, 1831, which resulted in the murders of 55 people. It is told through powerful images and selected excerpts from Turner’s confession as told to Thomas R. Gray while Turner was in prison awaiting his hanging. How the power of education, reading, and the Bible empowered Turner and other slaves to find the direction and courage to rebel. Research and review newspaper articles depicting the events of Nat Turner’s rebellion. Compare and contrast stories from the North and the South (see below for links). Compare and contrast the effects of violent versus non-violent protests towards civil and human rights. Research and discuss different Black writings and memoirs from the era in an effort to gain deeper understanding of slavery (see below for resources). In Nat Turner, Baker alludes to two incidents of runaway slaves. Research and discuss what running away meant to those who attempted escape, to those who succeeded, to those who failed, and to those who remained behind. Analyze how the book’s different characters dealt with slavery. Discuss how slavery was an ingrained aspect of “culture” in early American life. Discuss different means of protest. Discuss how these options have changed today, if at all. Discuss protest options slaves like Turner had, comparing his options to those men like Congressman John Lewis — who wrote March, which we featured in this column earlier this month — and Martin Luther King, Jr. had a century later in the 1960s. Then, compare to the means of protest that people use today. Have students use Nat Turner’s confession and re-write it as a play in which characters use contemporary language and vernacular. Have students write a narrative that retells the events depicted in the book. Discuss and evaluate the tone Turner uses as he retells the events of the insurrection (pp.112-179). Discuss/analyze Turner’s use of scripture and how his faith in the Bible and its scripture shaped the man and his actions. 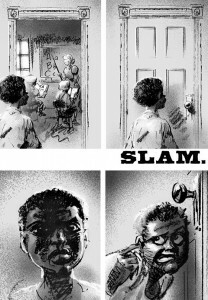 In graphic novels, images are used to relay messages with and without accompanying text, adding additional dimension to the story. This book is a particularly outstanding example of storytelling through images as there is very little text. On page 39, we see sharks swimming with the slave boats. Note how the shape of the sharks’ dorsal fins mirror the shape of the clippers’ sails. Discuss the Baker’s use of sharks. Does he include them as a metaphor or to imply that the sharks swam with the boats because to eat the carcasses of dead bodies were thrown to them throughout the voyage? Discuss how Baker uses images within images to help us focus on the primary versus secondary aspects of the story. Evaluate and discuss how Baker draws slaves versus their white masters. Is there a difference? Why? Compare and contrast poster/advertisement found on page 10 at the beginning of the book with the one on page 205 at the end. Discuss why Baker may have included it, and why it is presented in different fonts and modes. Discuss and evaluate why some pages consist of a single image and others have multiple images. How does the page design help relay the story’s crucial events, thoughts and emotions? The Confessions of Nat Turner by William Styron: Tells Turner’s story from his perspective as he lingers in jail awaiting execution. It spans Turner’s life up to the bloody days in August as he leads the revolt across southeastern Virginia. Incidents in the Life of a Slave Girl by Harriet Jacobs: An autobiographical account written and published in 1861 and one of the few extant narratives of slavery written by a woman. 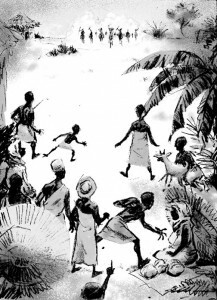 Roots by Alex Haley: Traces his family’s origin to an African village. Bullwhip Days the Slaves Remember by James Mellon: A compilation of stories told by former slaves in their own voices as they recount the harsh realities of slavery. Unspoken: A Story from the Underground Railroad by Henry Cole: A wordless story of a farm girl who discovers a runaway slave hiding in their barn. 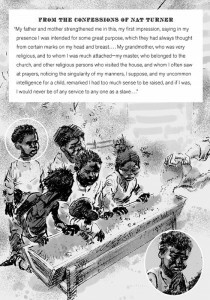 To Be a Slave by Julius Lester: A powerful collection of narratives gathered from slaves and former slaves. Amistad: A Long Road to Freedom by Walter Dean Myers: About the slave ship Amistad and how it was grounded after captured Africans on board took control of the ship. Myers’ uses archival documents while exploring the social and legal ramifications of this event. Breaking the Chains: African American Slave Resistance by William Loren Katz: Examines active and passive means used by black men and women as they dealt with the hardships and realities of slavery. The Slave Dancer by Paula Fox: An award winning book about Jessie Collier, who is kidnapped and dumped onboard a slave ship, where he must play his fife to keep the slaves dancing, ensuring their muscles and bodies are fit for sale. Jessie must learn to face the horrors and hazards of life onboard The Moonlight. Sarny: A Life Remembered by Gary Paulsen: About a woman, Sarny, who gains her freedom and searches for the children who were stripped from her and sold before the Civil War. March by John Lewis, Andrew Aydin, and Nate Powell: Relates the true story of Congressman John Lewis’s youth in rural Alabama and involvement in the Civil Rights Movement. 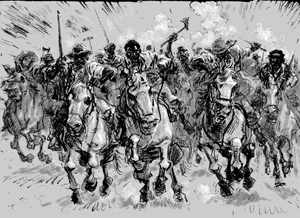 The graphic novel can be used to compare both storytelling styles and modes of protest. Vocabulary Acquisition and Use: Determine or clarify the meaning of unknown and multiple-meaning words and phrases by using context clues, analyzing meaningful word parts, and consulting general and specialized reference materials; demonstrate understanding of figurative language, word relationships, and nuances in word meaning. Comprehension and collaboration: Integrate and evaluate information presented in diverse media and formats, including visually, quantitatively and orally; evaluate a speaker’s point of view, reasoning, and use of evidence and rhetoric. Presentation of knowledge and ideas: Adapt speech to a variety of contexts and communicative tasks, demonstrating command of formal English when indicated or appropriate. 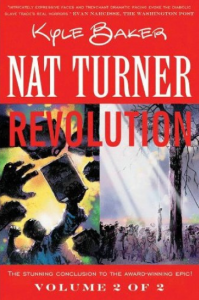 Nat Turner Resources from PBS: Contains detailed information about the rebellion, links to Nat Turner’s confession, details on how Nat Turner was discovered, text of Richmond Enquire’s article on Nat Turner’s rebellion, and a teacher’s guide. Scholastic’s resources: The Underground Railroad: Escape from Slavery: Students can follow escaped slaves in 1860; there are slideshows, primary sources, activities, teachers guide, myths uncovered and Underground Railroad videos. All images (c) Kyle Baker.